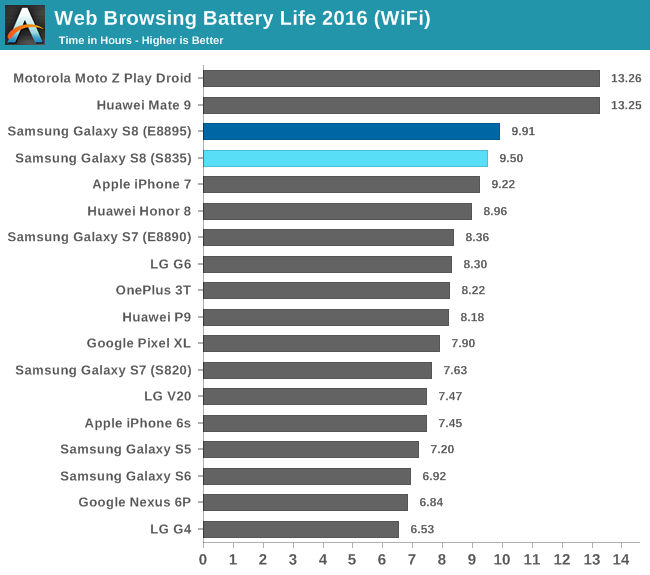 When Samsung introduced the Galaxy S7 last year, we were happy to see a larger 3000 mAh (11.55 Wh) battery inside, a significant increase over the 2550 mAh (9.81 Wh) unit inside the Galaxy S6. There is no further capacity increase this year, however. The S8 retains the same 3000 mAh (11.55 Wh) battery, which is the same capacity found in the HTC U11. The LG G6, perhaps the S8’s closest competitor, comes with a larger 3300 mAh (12.54 Wh) unit, which could help keep it running a little longer. To see how Samsung’s two SoC choices affect the S8’s battery life, and see how it stacks up to its competitors, we’ll run it through our standard suite of battery tests. To make the tests accurate and repeatable, we control as many variables as possible, including minimizing background tasks and calibrating each display to 200 nits at 100% APL. All of the Android phones in the charts below except for the S7 (E8890) have all available software updates applied and are running the same version of Chrome. The Galaxy S8 does quite well in our Wi-Fi browsing test that loads, pauses, and then scrolls through a set of popular websites while connected to Wi-Fi with the cellular radio turned off. We do not see much difference in runtime (only 25 minutes or 4%) between the E8895 version and the S835 version here, mainly because this workload does not utilize the big CPU cores that much, and the display tends to be the greatest power consumer in this scenario. Shutting down just shy of the 10 hour mark, the S8 outlasts the iPhone 7 by either 17 or 41 minutes, a noteworthy accomplishment considering the S8 uses a larger AMOLED display that needs to cope with relatively high APL web content (lots of white backgrounds). The S8 (S835) also lasts nearly 1.25 hours longer than the LG G6 (S821), despite the latter phone having a bigger battery. Of the two Exynos powered Galaxies, the E8895 S8 lasts 1.5 hours longer than the E8890 S7. The E8890 is hardly the most power efficient SoC, so this likely accounts for some but not all of the difference. The gap between the Snapdragon Galaxies is even bigger, with the S835 S8 browsing for 1.9 hours longer than the S820 S7. PCMark’s mixed workloads exercise the CPU, GPU, storage, and memory subsystems, giving us a more complete evaluation of battery life. Huawei’s Mate 9 runs longer than the S8 because of its larger 4000 mAh battery, but the S8 actually does quite well, with no appreciable difference in runtime between the two S8 models. Unfortunately, I was not able to take accurate power measurements, so we can only use average platform power consumption over the duration of the test for comparison, but the S8, regardless of SoC choice, uses considerably less power than the S5, S6, or S7 (S820). 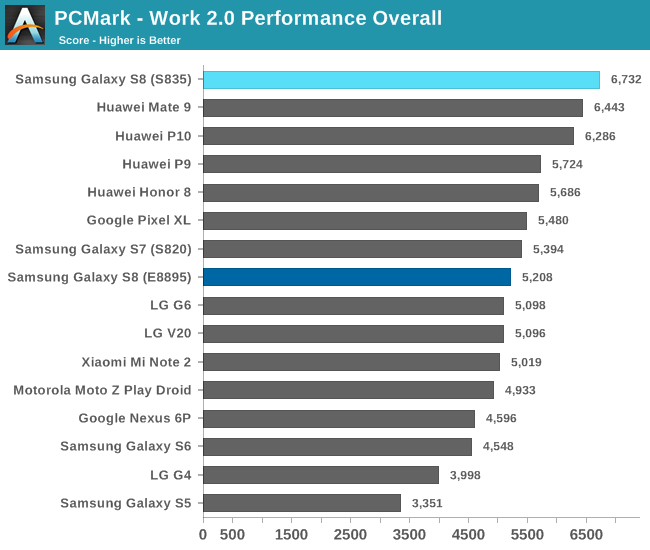 After factoring in overall PCMark performance, the S8 (S835) has the highest average efficiency of any device in this chart—about 24% better than the S8 (E8895). In the Wi-Fi Web browsing test, we saw very little difference between the two SoCs under a relatively light CPU load. The S8 (S835) manages to distinguish itself in PCMark primarily because of its more efficient GPU (Photo/Video Editing tests), which did not factor into the Wi-Fi browsing results. While not as efficient as the S835 version or the Mate 9 and its Kirin 960 SoC, the S8 (E8895) is still better than the LG G6 and the older Galaxy phones. The S8’s settings menu offers a choice between several preset performance modes that affect sound quality, screen brightness, and screen resolution, among other things. For the results shown in the charts above, the S8s used the default “Optimized” setting that reduces the screen resolution to FHD+ (2220x1080). Running the PCMark battery test at its highest WQHD+ (2960x1440) setting has no appreciable affect on battery life, however, regardless of SoC. 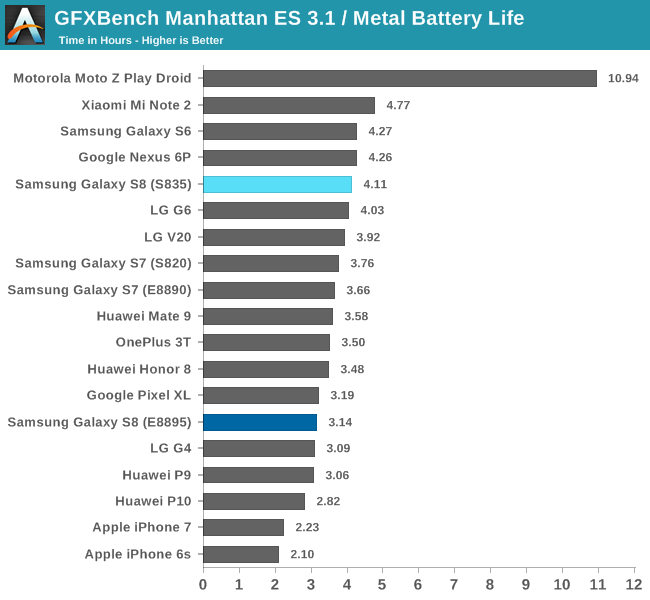 In the GFXBench Manhattan 3.1 battery life test, which predicts runtime while playing games, there’s a significant disparity between the S8’s two SoCs. The S835 S8 lasts about an hour longer than the E8895 S8, even though both deliver nearly identical steady-state performance during most of the test. 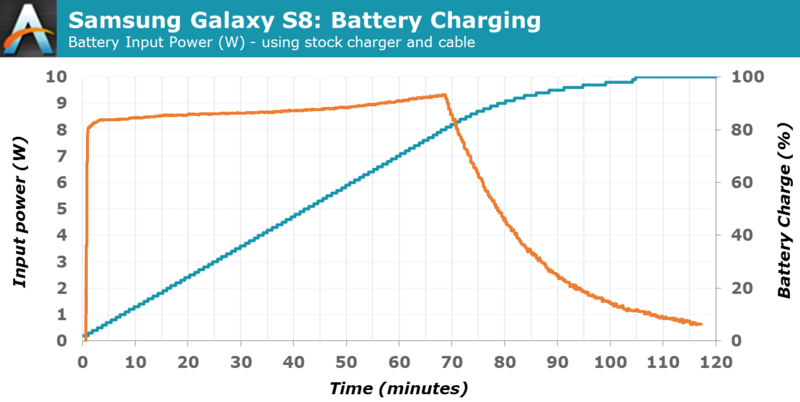 Using the average platform power to calculate efficiency (performance per watt) after the two phones reach steady-state shows the S835 S8 with a 39% advantage over the E8895 S8. Our E8895 example does seem to have a poor bin for both the CPU and GPU, an issue that seems fairly common with the early batch of 10nm SoCs, which likely skews the results somewhat, but it cannot account for this large of a gap. This is the second SoC example we’ve seen using ARM’s Mali-G71 GPU—the first being HiSilicon’s Kirin 960—and performance per watt is disappointing for both in workloads that really stress the GPU. The GPU configurations are significantly different too: The Kirin 960 uses 8 cores running at up to 1037MHz on TSMC’s 16nm FFC process, while the Exynos 8895 uses 20 cores running at up to 546MHz on Samsung’s 10nm LPE process. Without more detailed data, this is just an interesting observation rather than a definitive statement about the G71’s or E8895’s power consumption. While the E8895 S8’s battery life in this test falls within the 3-3.5 hour average for flagship phones, the S835 S8’s 4.1 hour mark is pretty impressive. It’s certainly not the longest lasting, but the phones that run longer deliver lower performance. For example, the S8 (S835) offers double the sustained performance of either S7 model while lasting 20 minutes longer. The Galaxy S6 outlasts the S8 (S835) by a slim margin but only because it throttles back performance so severely. 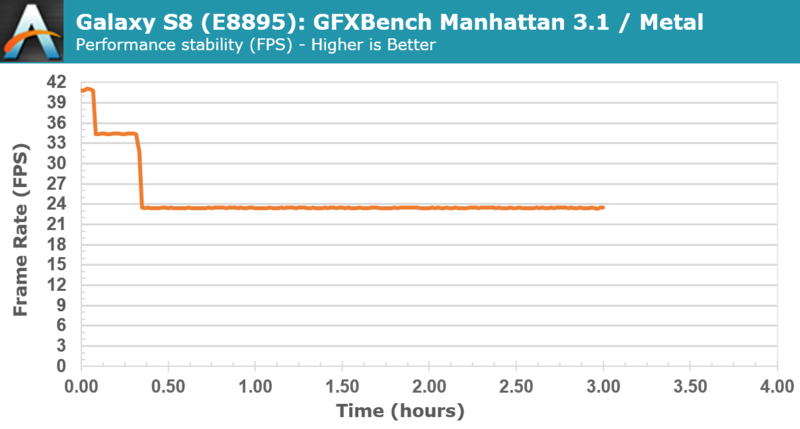 The E8895 S8 achieves better peak performance than the S835 model initially, but begins to throttle back the GPU frequency just shy of 5 minutes to stay within its thermal limits. The S835 S8 maintains peak performance for about 13 minutes before throttling. Interestingly, both S8 models deliver the same performance after reaching steady-state 21 minutes into the test. 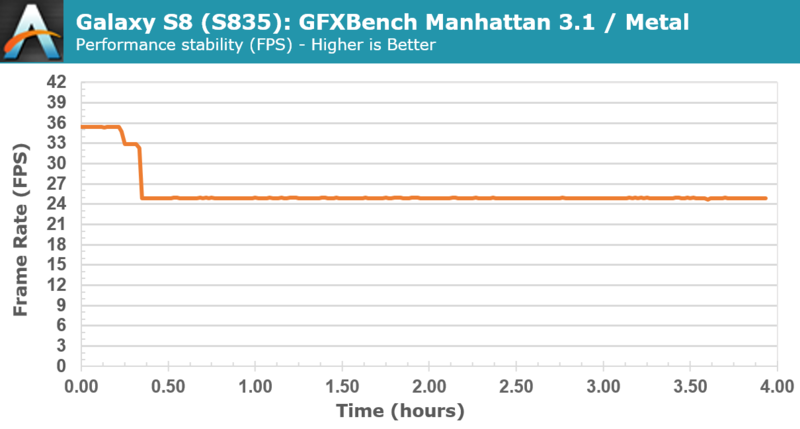 The E8895 model consumes more power (and generates more heat) at the same performance level as the S835 model in this test, so it appears the E8895 S8 is using a higher thermal limit, although I was unable to confirm this in the short time I had with it. Both Galaxy S8 models have higher sustained performance than other flagships. 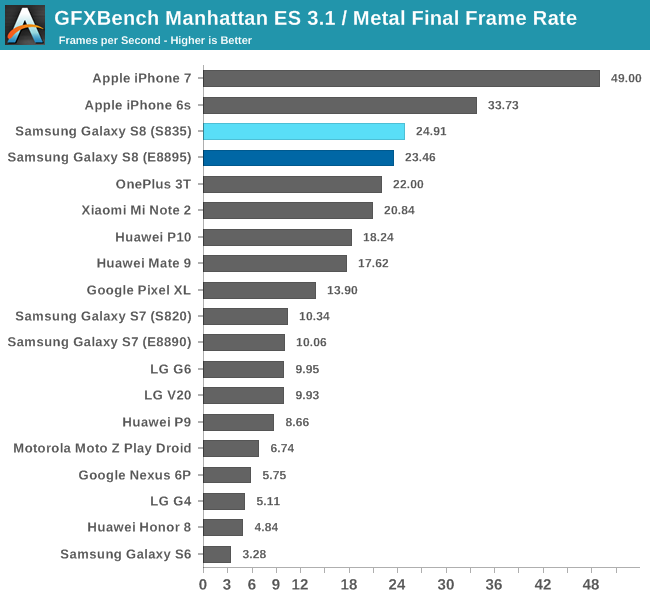 The Mate 9, for example, loses 38% of its peak performance after just 8 minutes, dropping to 21fps from 34fps, and remains at 19fps after about 30 minutes. The LG G6 starts at 16fps and begins throttling after 4 minutes before settling at 10fps after 13 minutes. The previous generation Galaxy S7 (S820) yields similar results to the G6: It starts at 16fps and starts throttling at the 13 minute mark, eventually settling at 8fps after 21 minutes. The Galaxy S8 comes with Samsung’s Adaptive Fast Charging technology along with both WPC and PMA wireless charging. 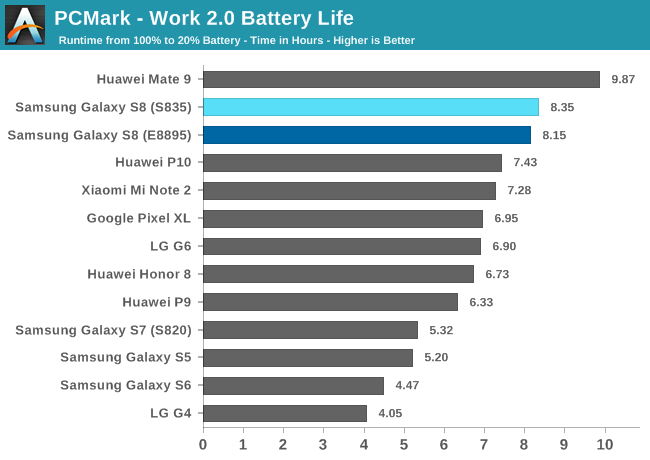 Unlike some companies, such as Huawei and Motorola, that are pulling more than 20W of power at the battery, Samsung remains a bit more conservative. The included wall charger is rated for 5V/2A (10W) and 9V/1.67A (15W) operation—same as the Galaxy S7—which translates to a peak of 9.3W at the battery when charging with the screen off. Turning the screen on reduces the peak charging power to just 4.3W, so the S8 will not charge nearly as fast while you are using it. The peak charging period lasts for 1 hour and 9 minutes before ramping down exponentially. 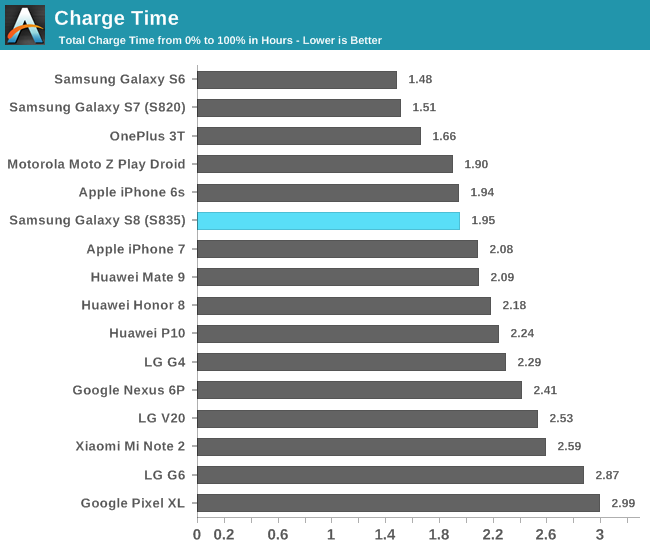 This gets the S8 to 25% in 21 minutes and 50% in 42 minutes, very similar to the LG G6 and its almost 10% larger battery, which gets to 25% in 25 minutes and 50% in 46 minutes; however, the S8 is fully charged in just under 2 hours where the G6 takes 2 hours and 52 minutes. As another point of comparison, Huawei’s Mate 9, which has a much larger 4000 mAh battery, pulls up to 20.2W at the battery and reaches 25% capacity in about 12.5 minutes, 50% in about 25.5 minutes, and 100% in 2 hours and 5 minutes.